Of the 150 known Hawaiian petroglyph sites, most are on the Big Island. The majority of these ki’i pohaku (rock carvings) depict events during the 1000 to 1,500 year period before Western culture arrived in the late 1700s. On the periphery of some petroglyph fields there are often also found post-contact images that depict men on horseback, sailing ships, names and Roman letters. 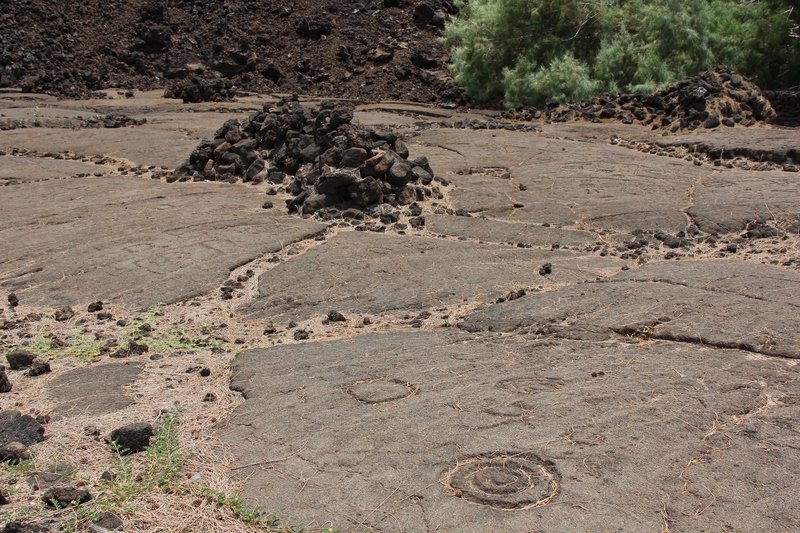 One of the most accessible, viewer-friendly fields is the Waikoloa Petroglyph Preserve. It is found surrounded by a shopping center and condominium developments at Waikoloa Beach Resort on Hawaii Island’s west coast. Waikoloa Beach Resort is a multi-million dollar oasis built in the middle of the centuries old lava flows off Highway 19 north of Kona. The entrance to the resort is located between mile markers 77 and 76 heading north on Highway 19. A short hike along the Mamalahoa Trail, or King’s Trail, leads to some of the most well-preserved petroglyphs on the island. To access the trail, park in the King Shops shopping center near the gas station and walk towards the golf course and small pond. Signs will lead you to the trailhead. Wear sturdy shoes for hiking on the lava trail and bring water. There are several historical signs along the way to guide you. For those interested in the history and culture of Hawaii, ki’i pōhaku (petroglyphs) are a must-see. When you go, be respectful and stay on designated viewing platforms and paths. Take care to tread lightly around the fields, it is strictly forbidden to touch the rock images, walk on them or attempt to make rubbings or casting of any kind. Human actions like this destroy works that have endured for centuries. Why does anyone study rock art? Our place in the local environment can be better appreciated when we add to it the perspective of another culture’s experience in the same environment. Beyond the basic curiosity on an initial encounter with the art, historic or scientific interest and cultural values can be preserved for present and future generations. For those future generations, developing a sense of place can help them adopt an ecological outlook and to live in a more sustainable manner. Studying the culture of a preliterate society includes reducing aspects of the human experience to less complexity, thus enabling the student of life to more easily perceive the essence of what is important. Delving into the meaning of this art may help us to come to terms with the relationship of people to their environment and our place in the world today. Old Hawaii before the times of King Kamehameha was divided into separate ancient kingdoms and borders were not crossed casually. 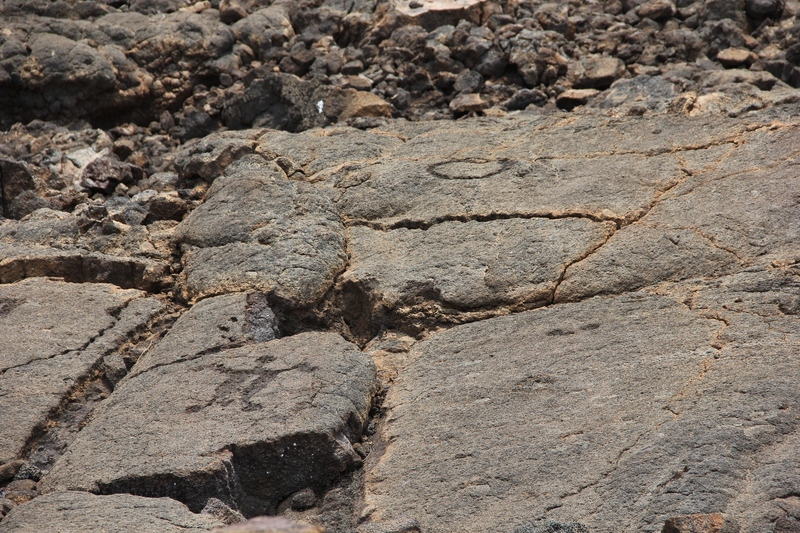 The Waikoloa petroglyph field is just north of the border between the ancient kingdoms of Kohala and Kona. Cave shelters and simple “C”- shaped windbreak encampments in an unrepaired state dot the landscape here. The encampments may have been used by armies poised to defend or attack the border or by groups waiting for permission to cross. The thousands of petroglyphs carved here suggest that there was either a religious or commemorative significance in crossing this border although the true meaning is unknown. 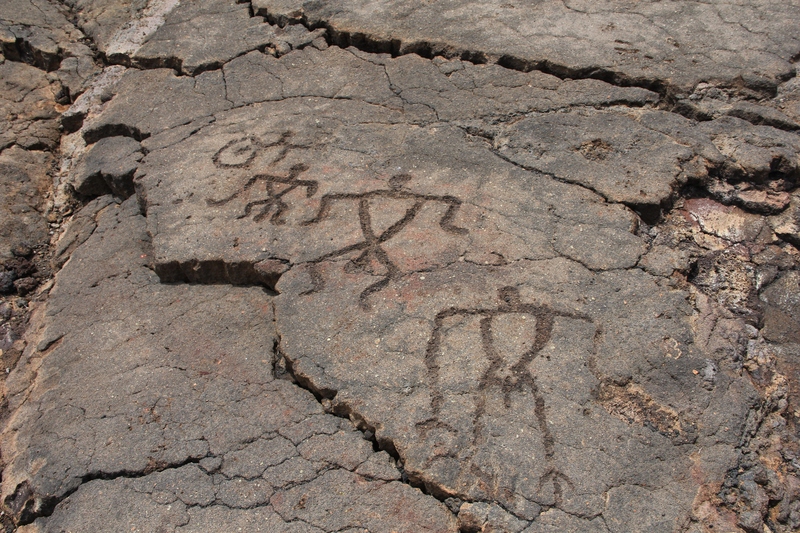 Hawaiian petroglyph images are most often found clustered near historic land boundaries or along foot “highways” through lava fields, but the full reasons for their location and creation remain a mystery. Sadly, development has destroyed many of these treasures–ancient images that escaped destruction by earthquake or lava flow were destroyed during the construction of resorts and golf courses. Some of the fields however, have been preserved and are accessible by the public. VIDEO: 3:48 minutes. For best quality press You Tube icon or view in full screen. Historic sites are tangible evidence of a colorful, rich heritage and provide society with a sense of continuity. Heritage is our legacy from the past, what we live with today, and what we pass on to future generations. There is a broad public interest for the Hawaiian heritage, as well as support for the care and management of archeological sites. Please, take care of the land – tread lightly. On the United States mainland the Antiquities Act of 1906 was the first law to establish that archeological sites on public lands are important public resources. The Act grew out of concerns that developed over the course of the last quarter of the 19th century for the preservation (particularly in the Southwest) of America’s archeological sites and the artifacts and information that they contained. Wilderness advocates like John Muir, national educators and scientists, including those involved in the developing profession of archeology, joined together in a movement to safeguard sites on public lands being endangered by haphazard digging and purposeful, commercial artifact looting. After a generation-long effort, on June 8, 1906, President Theodore Roosevelt signed the Antiquities Act into law, thus establishing the first general legal protection of cultural and natural resources in the United States. Malama ‘Aina – Take care of the land! This entry was posted in Art, environment, history, the hungry brain and tagged Art, environment, Hawaii, hiking, history, photography, preservation. Bookmark the permalink. Where did the Englishbletteres come from? Protestant missionaries from Connecticut and Massachusetts arrived early 1800s and taught reading and writing. 90% of the Hawaiian people became literate in only a few short years. It was tradition to come to areas such as the petroglyph fields with circles crescents and little puka’s (holes) carved families would travel to place there child’s piko (belly button cord; and many other meanings) here. Great post! I had no idea there was anything like that in Hawaii. Fascinating piece, Dohn… isn’t it interesting how many ancient civilisations have left their mark on rock…. That is fascinating, Dohn. Some of those carvings – the circular ones and concentric rings – are similar, if not identical, to the Bronze Age cup and ring carvings scattered around upland Britain. Again, their meanings have been lost. Alen, I remember you writing about cup and rings some time back and the similarity caught my attention then. Some of the cups in Britain were carved much deeper I recollect but the symbolism remains. Theories have been put forth but the meaning is still unclear… I’m on the trail. I also believe we have much to learn from preliterate societies. Very illuminating, thank you! Wonderful, as always. Thank you.